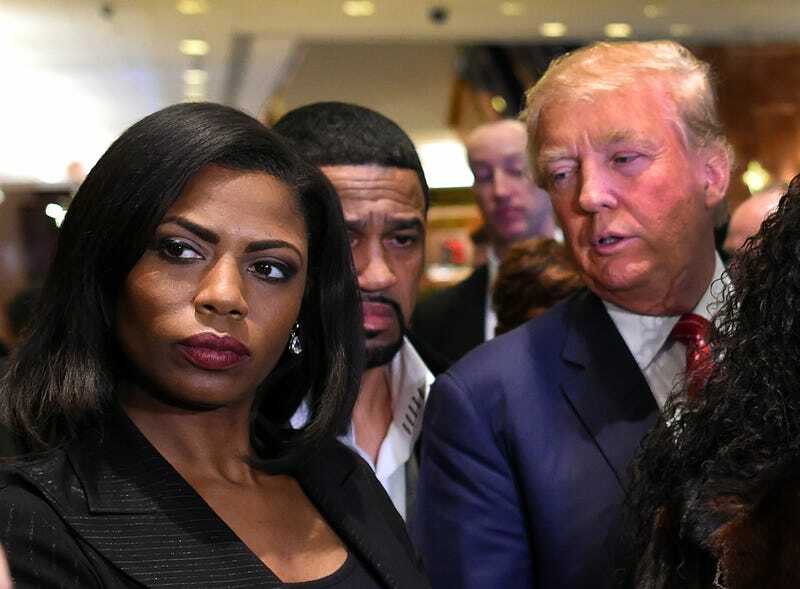 Omarosa Manigault appears alongside Donald Trump during a press conference Nov. 30, 2015, that followed Trump’s meeting with African-American religious leaders in New York City. The surprise victory of reality-TV star and businessman Donald Trump will mean positions of power for one of the loneliest segments of the Grand Ol’ Party: black Republicans, long vilified as being political "traitors to the race." The pressure on black Republicans who helped Trump win the presidential election was even more intense than normal this political cycle given Trump's stereotyping of black communities as violent, his father's housing discrimination and Trump's continual vilification of the Central Park Five. Even with all of that, 8 percent of African Americans voted for Trump, 2 percentage points more than for Mitt Romney in 2012. Supporting Trump was viewed as a waste of time and a suicide mission, views that appeared to be backed up in polls showing his black support at zero in some cities. But with Trump's predicted-by-nobody victory, there are some African-American supporters almost certain to find themselves in positions of power. Some names you can expect to pop up as the Trump administration chooses staff and members of the Cabinet are Milwaukee County Sheriff David Clarke, CNN political analyst Paris Dennard, Republican National Committee outreach fellow Leah LeVell, Thurgood Marshall College Fund President and CEO Johnny Taylor, and Bob Woodson, founder and president of the Center for Neighborhood Enterprise. What job each person would occupy is hard to identify in such early stages, but there are more than 1,800 jobs to fill as part of the Executive Office of the President, and filling them will take months. One name you won’t see is Dr. Ben Carson, who pulled his name from consideration for a Cabinet position because he felt he was unqualified. But here’s a list of 10 of the most obvious African Americans who worked to elect Trump who are likely to serve in his administration. Lauren Victoria Burke is a Washington, D.C.-based political reporter who writes the Crew of 42 blog. She appears regularly on NewsOne Now with Roland Martin on TV One. Follow her on Twitter. Former Cincinnati Mayor Ken Blackwell is said to be in charge of domestic policy on the Trump transition team. Blackwell also was an undersecretary at the Department of Housing and Urban Affairs under President George H.W. Bush for a year. A senior adviser to Republican National Committee Chairman Reince Priebus and a veteran of the presidential campaign of Sen. Rand Paul (R-Ky.), Sailor is a well-known and well-connected Republican operative who has also served in the House leadership office of former Rep. J.C. Watts. James served as director of the Office of Personnel Management under President George W. Bush from 2001 to 2005 and was a former dean of Regent University's Robertson School of Government. She also held the job of secretary of health and human resources in Virginia under former Republican Gov. George Allen. Bell is a former county commissioner in Hall County, Ga., who is well-versed in local politics, communications and community outreach. He has been operating as the senior strategist and national director for African-American engagement for the RNC since August, the highest-ranking African American in the GOP campaign for the White House. Telly Lovelace recently left the IR+Media public relations firm to take on African-American outreach for the Republican National Committee. Lovelace has been a veteran GOP communications strategist (he’s the former managing director of IR+Media) and became the leader of the RNC's black political engagement at one of the most difficult times in the 2016 presidential campaign: right after the mass exit of black staffers from the RNC when it became clear that Trump would win the GOP nomination. The executive director of the National Diversity Coalition for Trump is a businessman from Georgia who might be an interesting choice to head the Small Business Administration, which gave less than 2 percent of its loans to African-American businesses under the Obama administration. LeVell would also be a shoe-in for any position in a Trump administration that requires coalition building. Patton is the vice president of the Eric Trump Foundation and handles all of the foundation's events and social media. She also has been a defender of the Trump family against accusations of racism and probably is best-known for releasing a video in which she tearfully expressed her devotion to the Trump family. Patton is the closest African-American adviser to the Trump family. The former Apprentice star is bound to have a position in the Trump administration; the question is, what will it be? Manigault served as Trump's director of African-American outreach at a time when no one believed Trump would get any African-American support. Pierson was the often-seen public face of the Trump campaign on cable news from the very beginning. It's likely that the Trump administration will need her "take no prisoners" style of communication as someone who will unflinchingly and wholeheartedly stand up for Trump's decisions, just as she did during the campaign. Robinson is an education-policy expert at the American Enterprise Institute. His focus has been on school choice, the role of for-profit institutions in education and HBCUs.